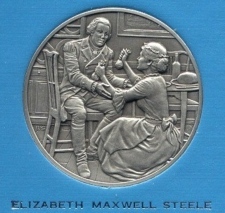 On this day in history, February 2, 1781, Elizabeth Maxwell Steele gives her coins to General Nathanael Greene. Lt. Gen. Charles Cornwallis was hotly pursuing the remnants of General Daniel Morgan's army after his victory over British Lt. Col. Banastre Tarleton at the Battle of Cowpens a few weeks before. On the morning of February 1, Cornwallis and 5,000 soldiers had crossed the Catawba River at Cowan's Ford and killed North Carolina General William Lee Davidson. After Davidson was killed, the North Carolina militia scattered and many gathered at Torrence's Tavern, a few miles to the north. When the locals heard the fighting, many began to flee with their belongings, causing the roads to be flooded with refugees, many of whom gathered at Torrence's Tavern, expecting the militia to protect them. Tarleton meanwhile heard of the gathering and attacked the tavern in the afternoon, causing the entire group to scatter and killing several militia. The next day, General Cornwallis burned the tavern to the ground. General Greene, who was the top commander of the Continental Army in the South, waited for the militia at David Carr's farm several miles to the north, where he planned to meet with them and go on to Salisbury, the rendezvous point for the two branches of his southern army. The militia, however, had scattered after the attack at the tavern and did not show up to meet him. Greene was on horseback by himself and decided to go on to Salisbury alone. He rode through the night and arrived in the morning where he went for breakfast at Steele's Tavern, run by Elizabeth Maxwell Steele. Greene was discouraged, having just learned of General Davidson's death and the attack at Torrence's Tavern. He also realized that other parts of his army had not yet arrived and that Cornwallis was very near with thousands of troops. Greene's personal physician, Dr. Read, happened to be at the tavern when he arrived. Read asked the general how he was doing and Greene replied, "Fatigued, hungry, alone and penniless." Elizabeth Maxwell Steele was serving breakfast and overheard the comment. She came back with two bags of coins and gave them to the general, saying, "Take these, for you will want them, and I can do without them." Her gift now made up the entire treasury of the southern army. 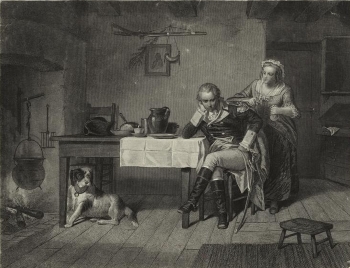 General Greene was so moved and encouraged at Mrs. Steele's patriotism and generosity, that he took down a portrait of King George III from the wall and wrote, "O George, Hide thy face and mourn," on the back of it and then placed it back on the wall with George's face to the wall. Elizabeth Maxwell Steele earned her place in history by this act of patriotism; General Greene's disparate forces would soon gather and destroy a quarter of Cornwallis' army only six weeks later at the Battle of Guilford Courthouse; and the picture of King George with Nathanael Greene's comment scrawled across the back still remains to this day in the Thyatira Presbyterian Church Museum in Salisbury. Read more about the Battle of Cowpens here. Read more about the Battle of Cowan's Ford here.